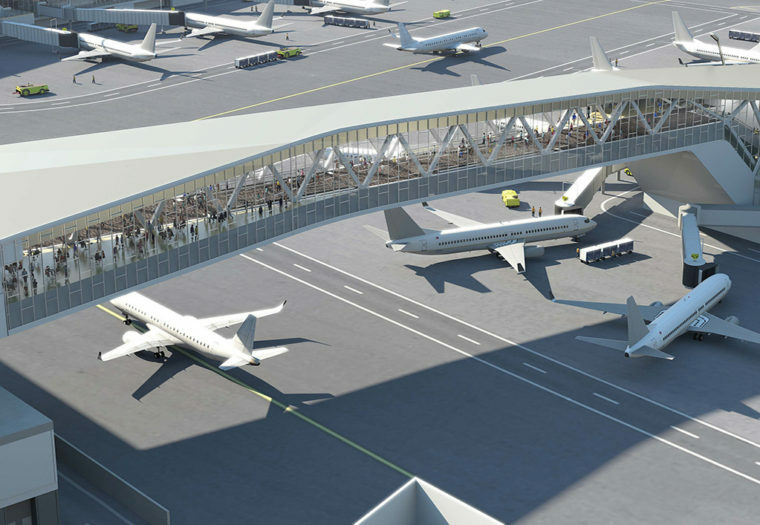 Innovative Solutions in Sprinkler System Design - Arora Engineers, Inc.
A $4 billion program is currently in progress to upgrade Terminal B, formerly referred to as the Central Terminal Building (CTB), at LaGuardia Airport in Queens, NY. Arora Engineers, Inc. (Arora) was chosen to provide Fire/Life Safety engineering services for the project as a subconsultant to the Skanska Walsh Design/Build Joint Venture team with HOK as the lead architect. 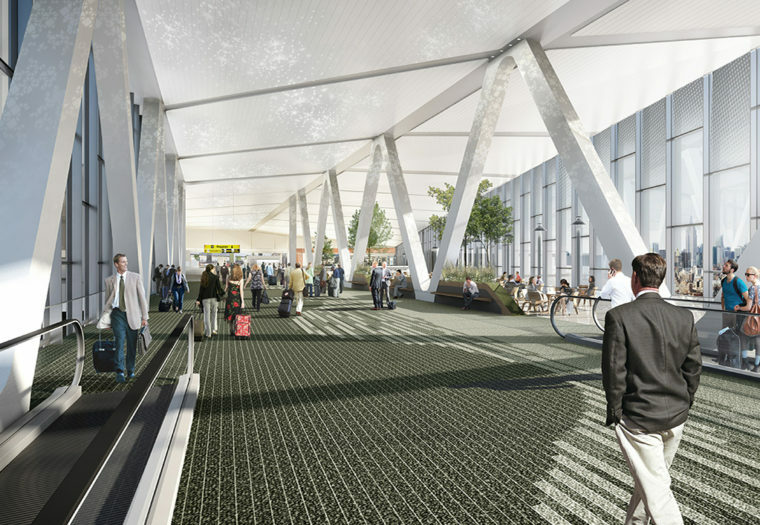 Due to the size and occupancy, the new Terminal B is required to be a fully sprinklered building, which required Arora to design a variety of fire protection systems to accommodate the terminal’s diversity of hazards and physical configuration. 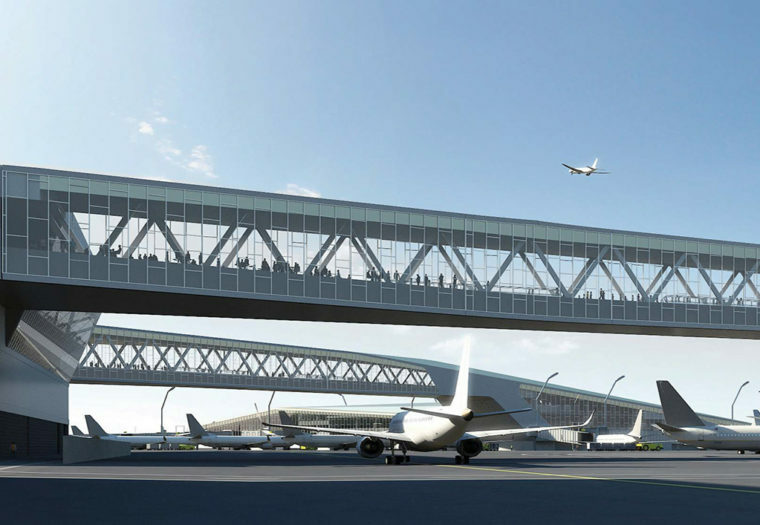 The most challenging elements of the new terminal were the two pedestrian “fly-over” bridges that span more than 400 feet from the Headhouse, where passengers check-in and clear security, to Concourse A and B, where the departing gates are located. The enclosed bridges are 40 feet wide at their narrowest and located approximately 60 feet above the active taxiway used by aircraft. While originally defining the design approach for this unique structure, the team found that there was no prescriptive standard for this particular situation and few examples to study. Denver International Airport was the only other national airport the team found that includes a pedestrian bridge that crosses over an active taxiway. After speaking with contacts in Denver, the team discovered that the bridge has no means of exterior fire protection to protect from an aircraft fire. When the airport was designed and constructed during the mid-1990s, it is assumed that the bridge was compliant with applicable codes and standards. However, based on the current edition of NFPA 415, exterior glazing (or glass) located within 100 feet of a potential fuel spill must be protected. Based on the requirements of NFPA 415 and a group of project stakeholders dedicated to safe environments, Arora led the team in defining the aircraft hazard beneath the bridge that would be used for developing a fire model. Based on an analysis of the team’s fire model and discussions with project stakeholders, Arora designed two fire protection systems, glazing protection sprinklers and under-bridge sprinklers, which were both required by code. Both systems are designed to provide a cooling effect to protect the occupants inside and maintain the integrity of the bridge. Therefore, the design objective is to protect the structure itself from failure and is intended to work in conjunction with the Airport Rescue and Firefighting team (ARFF), which is responsible for extinguishing an aircraft fire beneath the bridge. Due to the massive size of the bridge glazing, the team needed to pursue innovative solutions. Because no sprinkler is listed to protect a 28-foot-high glass wall, Arora obtained and analyzed sprinkler manufacturer’s test results and determined an appropriate sprinkler for this application. In addition, the activation of all the glazing sprinklers simultaneously would exceed the facility’s water supply. To address the water supply issue, the glazing protection system for each bridge was sub-divided into multiple, zoned deluge sprinkler systems located and activated by a corresponding group of flame detectors. Now, in the event of a fire, the bridge has the ability to limit the activation to systems that are within 100 feet of the fire, keeping the water volume under the 5,000 gpm (gallons per minute) limit and complying with the intent of NFPA 415’s requirement for glazing protection. Upon analysis of the fire model, it was determined by the design team that the bridge structure, without the intervention of the glazing deluge systems, an under-bridge sprinkler system, or ARFF response, would maintain structural integrity for more than twice the required safe egress time. Although not required, the project stakeholders decided that the installation of sprinklers below the bridge was an efficient method to minimize risk and increase safety. In response, Arora designed dry sprinkler systems to protect beneath the entire underside of each bridge. The systems are designed to discharge water over approximately 6,500 square feet of the fire area when the temperature on the underside of the bridge exceeds 165°F. The objective of this system, like the glazing deluge system, is to protect the bridge structure, not extinguish the actual fire. Throughout this project, Arora consistently invested in developing innovative strategies to accomplish the goals of the stakeholders, as well as fulfill the applicable code requirements and safety objectives. These creative and functional design features can now be implemented in future projects that may pose similar challenges and enhance the protocol for handling comparable requirements.